Combination of Common Lizard basking on the boardwalk + 7 Marsh Frogs sitting in a small pool. 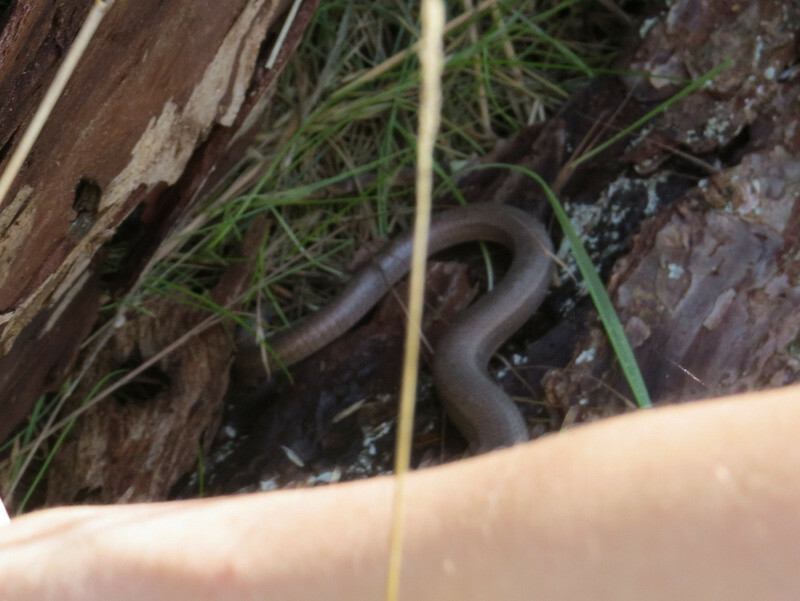 A Slow Worm at Denbies today. This frog attempting to hide in the Baby's Tears (Soleirolia) outside the pond. Haven't heard it called Baby's Tears before. The vernacular I've always know it by is Mind-your-own-business. Lovely photo! "Haven't heard it called Baby's Tears before"
Gardener's Tears would be more appropriate. I don't know why it's got so many names with negative connotations... it's also know as Angel's Tears. I've always liked it, (it can get a bit out of control, but I just go out with a pair of sissors and snip it back.) 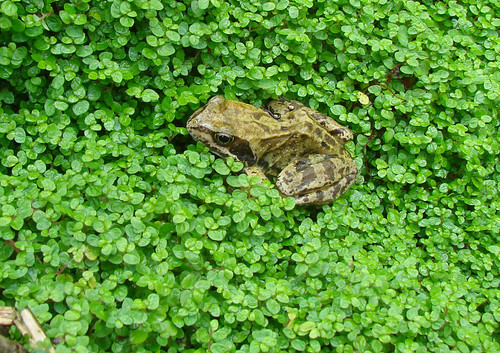 It gives a nice green carpet around the pond... the froglets are always hopping around on it. Why 'Mind your own Business', I wonder?? A VERY close encounter with a female Adder this morning. I was at a local site + was looking for reptiles but with an interest in most wildlife my eyes wander up + around. I didn't see any Adders in a favoured basking spot so continued along a small grass path. Fortunately I spotted her at the last minute just over a couple of feet in front of me. One more step + I may have stood on her or next to her when I probably would have been bitten. It was a cold, overcast morning + she remained motionless for a few more minutes before slinking back into the vegetation. Always a pleasure to see + so pleased I spotted her at the last moment. Obviously sluggish with the lack of much warmth. 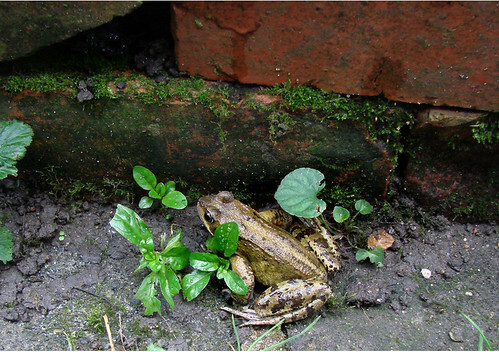 Bit chilly this morning for this frog to be out and about! I put him in amongst the plants around the pond, (which was very unappreciated...he protested strongly) to keep him from becoming a squeaky fox toy. A late basking Red-eared Terrapin on an LNR where I was counting wildfowl. My first sighting for 2016 yesterday. I was picking up some dead leaves in a raised planter when suddenly a fairly large Common Frog appeared from under them. Being fairly mild it seemed quite active + watched me for the next few minutes. There's been some frog activity in my pond over the last couple of days. I noticed 6 with their heads sticking out of the water yesterday + a little bit of splashing when I got home from work this afternoon. Same here...when I went out earlier, there was quite a bit of splashing from panicked frogs diving for cover. I have to remember to creep quietly past the pond now, if I want to see them! I was able to count SIX frogs this morning on the pond shelves.... definitely a sign of spring on the way. 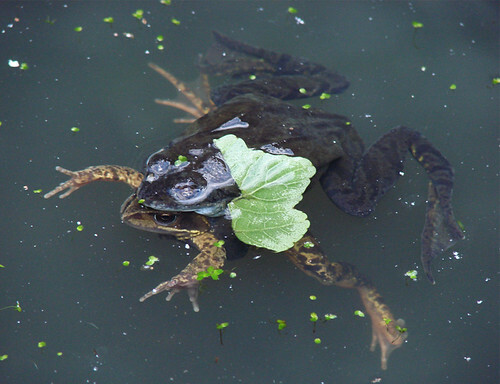 Saw the first frogs in amplexus today.